A Recap of Our First Ever Field Trip with YPT Philly! Thank you to our new friends at YPT Philadelphia for reaching out to us for such a great opportunity! A joint field trip to Wilmington, DE was a great way to wrap up our first year as a YPT chapter and we’d definitely join our Philadelphia peers for future events. For the big day, YPT Philadelphia enjoyed a trip on SEPTA’s regional rail, our Baltimore Chapter had to come up with an alternative since MARC does not run trains north of Perryville (sounds like a discussion topic). Some of YPT Baltimore took a ride on Amtrak, and the rest carpooled with a Zipcar named Stiffbeards. Once in Wilmington, DE we headed to Amtrak’s Consolidated National Operations Center (CNOC) and Centralized Electrification and Traffic Control (CETC) facility. 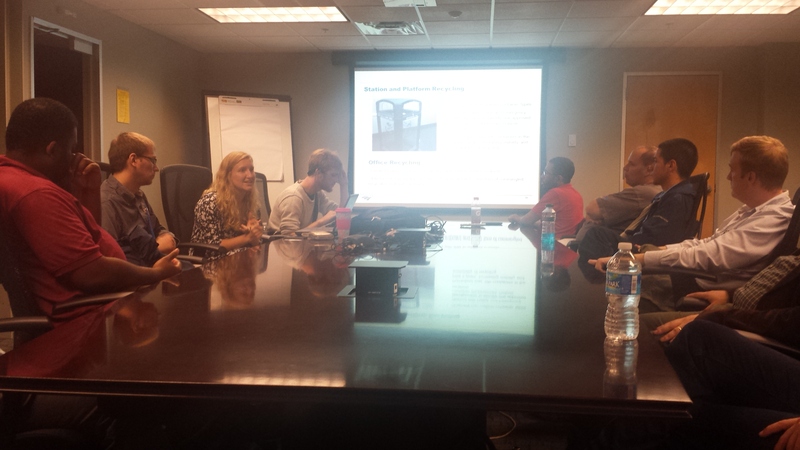 Our education began with an excellent presentation on Amtrak’s on- and off-board recycling efforts. Amtrak began its recycling program roughly four years ago and has made strides in not only making recycling easy, but taking the time to train its staff and to educate passengers on how to recycle. Our presenter pointed us to the Amtrak blog which has a post about both on-board and industrial recycling programs. Kelsey explains choosing the right recycling receptacles on Amtrak platforms. Recycling receptacles need to be bomb-proof and, in Wilmington’s case, wind-proof on those high, above grade platforms. A very well thought out, open floor plan allowing staff to collaborate quickly when issues arise. The CETC tour took us to another floor where we watched how signals and switches are controlled with the use of interactive, schematic representation of the Northeast Corridor spread across walls lined with giant monitors. While the majority of the Northeast Corridor is plugged into the CETC technology, we also got a chance to learn about the Harrisburg line which still operates with active towers and a lot of trust between the towers and CETC dispatchers. The walk from Amtrak to DART First State’s office gave us an opportunity to see Wilmington’s beautiful Riverfront just as the sun was setting. Our presenters from Delaware’s DART First State were incredibly generous to our group after we’d run overtime touring Amtrak. We learned about Delaware’s unique decision to provide Mobility service beyond the federally mandated 3/4 miles of fixed-route service, about recent and upcoming expansion of SEPTA service in Delaware, and other major plans and ongoing projects. As an added bonus, they gave us some pretty sweet swag bags to take home! We ended a very eventful day at the bright orange Iron Hill Brewery located along the Wilmington Riverfront. Service was excellent, the food and drinks were tasty, and conversation and a few laughs were had. 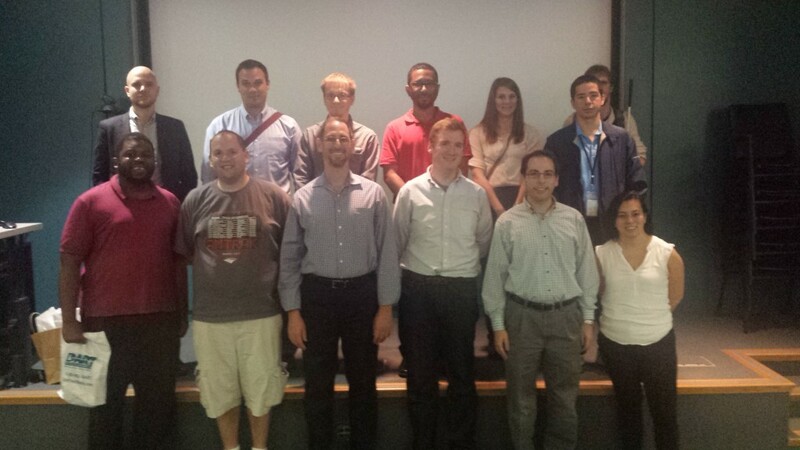 We hope everyone who attended had a great time, learned a lot, and will join us again at future meetups! This entry was posted in Field Trips and tagged Amtrak, CETC, CNOC, DART First State, Delaware, Field Trips, Joint Events, Networking, SEPTA, Young Professionals, YPT Philadelphia by Jade Clayton. Bookmark the permalink.